« For weddings and a funeral. Anyone watched You Gotta Eat Here? There are quite a few in and around BC, and the ones I’ve tried so far have all been winners. Well there are some great routes in BC. Let’s put them together. Who’s up for a little trip either the weekend of 11/12 of April or 18/19 April depending on the weather. All about the food and the ride. Stopping at restaurants from You Gotta Eat Here. Start at the Tomahawk in North Van for breakfast. On to Mile One Eating House in Pemberton for lunch a little later. Ride on past Duffey Lake and into Hope for a slice of pie at the Home (this one isn’t on You Gotta Eat here, but I’ve never manged to squeeze in pie here). 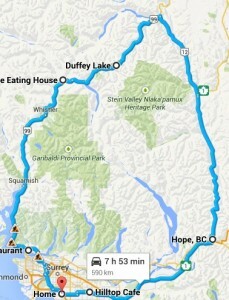 Then either the Hilltop Cafe in Langley or Big Feast in Maple Ridge. Google maps says it’s about 8 hours of driving. Probably another 3 hours of eating. And a week of indigestion.